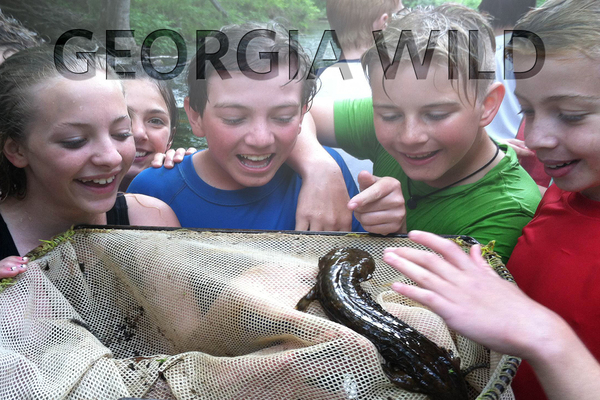 Eastern hellbenders will get new homes and other help through a six-state project powered by a federal grant and north Georgia middle-school students fascinated with the giant salamanders. A Southeastern Association of Fish and Wildlife Agencies proposal awarded a $500,000 competitive State Wildlife Grant last week aims to evaluate how effective nest boxes are for hellbenders, find more populations through environmental DNA and probe the species’ vulnerability to climate change. 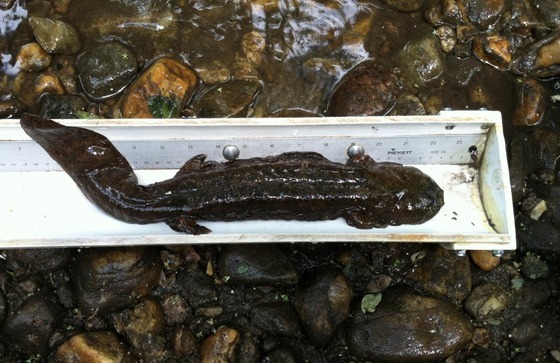 Hellbenders may be North America’s largest salamander, capable of growing longer than 2 feet. But sedimentation and other issues that plague the mountain streams they call home threaten these bellwethers of water quality. Read more in our blog about the project and the school’s role. There's a new Fab 5. Or as of now, a Terrific Trio. In early May, another five manatees were fitted with satellite transmitters for tracking along the Georgia/Florida coast. This marked the second year of a project providing researchers a clearer picture of how these big, rare animals use estuarine waters near the Kings Bay submarine base and along the rest of Georgia’s coast. Mapping manatee movements near Naval Submarine Base Kings Bay. Documenting migratory paths and habitat use in the Southeast. Collecting baseline data to help assess manatee health. Two of the manatees have since shed their transmitters. The devices, attached by tether and belt to the tail, part easily so the animal doesn't become entangled. 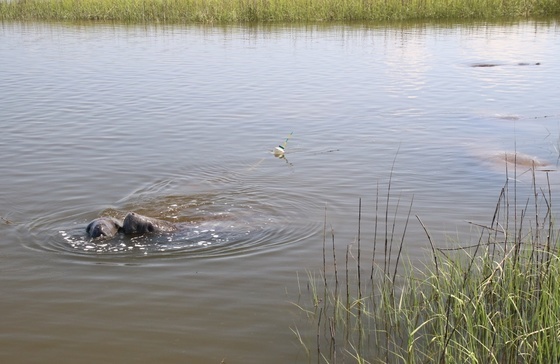 Yet the remaining three are providing more fine-scale GPS data, a first for manatees followed in Georgia and vital for the scientists following them. “We’re getting literally breadcrumbs of their movements,” said wildlife biologist Clay George, who leads marine mammal research for DNR. The manatees tracked last year produced surprises, such as frequently traveling in small creeks in addition to the Intracoastal Waterway. Understanding that use and migration timing can be used to help conserve this endangered species. As of May 31, two of the tagged manatees were in Camden County and one was in Jacksonville, Fla. See the latest map. Partners include DNR, Georgia Aquarium and Sea to Shore Alliance, along with others that helped fund the project and capture, assess and release the animals. If you see a tagged manatee: Report it to DNR by calling 1-800-2-SAVE-ME (800-272-8363). Note the time, date, location, tag color and whether other manatees are present. Do not chase, touch or otherwise harass the manatee, or touch the tag. The tag is harmless to the animal. Provide crucial support for researching manatees and other rare wildlife by purchasing or renewing an eagle or hummingbird license plate. These tags cost only $25 more than a standard plate and most of that fee goes to help wildlife. DNR's Nongame Conservation Section depends largely on these tags and other fundraisers to conserve Georgia's nongame wildlife, native plants and natural habitats. Four freshwater turtle species in North America are being added to Appendix III of the Convention on International Trade in Endangered Species of Wild Fauna and Flora, or CITES, a change that will require a permit to ship the turtles overseas. Listing common snapping and Florida, spiny and smooth softshell turtles – all native to Georgia except for smooth softshell – will provide data on legal trade, which can help inform decisions on regulating harvest. According to the U.S. Fish and Wildlife Service, freshwater turtles and tortoises are being collected and traded in “overwhelming numbers,” with trade most common in East Asia, where turtles are used mainly for food and traditional medicines. Red-cockaded woodpeckers are having a strong nesting season at Silver Lake Wildlife Management Area. 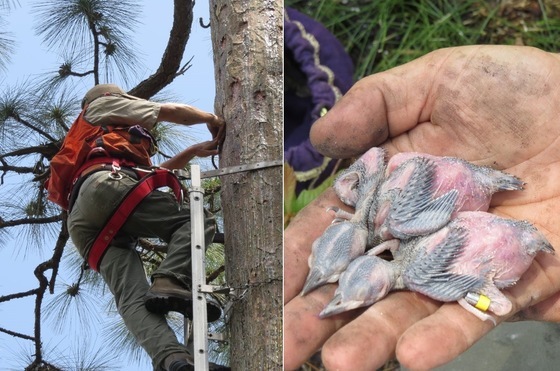 DNR wildlife biologist Joe Burnam has banded 39 nestlings with at least five nests to go, boosting hopes that 2016 will mirror last spring, when 40 young fledged at the Bainbridge-area WMA, the first state-owned property in Georgia with the endangered birds. Bat fans caught and released more than 119 bats totaling eight species on DNR and U.S. Forest Service lands at the third annual Bat Blitz, held May 12-14 at Cloudland Canyon State Park. The Georgia Bat Working Group event gathers scientists and others to collect bat data at targeted sites, while also featuring a public program, attended by about 40 people this year and led by DNR’s Katrina Morris and Anna Yellin. Sea turtle nesting is surging in Georgia, with more than 540 nests recorded by the Sea Turtle Cooperative as of May 31. All but one of the nests documented are from loggerheads, the state’s primary nesting sea turtle. Updates. Much of Musgrove Plantation on St. Simons Island will be preserved by St. Simons Land Trust. The organization recently acquired 58 acres and protected the property through a conservation easement with DNR, the first of a three-phrase agreement to buy 260 of the 450 acres that include Musgrove Creek frontage for a public boat launch and more than 100 rare plant and animal species. National Fishing and Boating Week June 4-12 is packed with opportunities to introduce children and others to the outdoors. Georgia offers two free fishing days, June 4 and 11 (no fishing licenses are required for Georgia residents), and free kids fishing events throughout the week and across the state. More than a third of North America’s bird species need “urgent conservation actions,” according to The State of North America’s Birds 2016. The North American Bird Conservation Initiative report, called the first comprehensive assessment of the 1,154 bird species native to Canada, the continental U.S. and Mexico, suggests ideas and resources for citizens, businesses and governments to help birds. Names in the news: Gov. Nathan Deal appointed Richard Dunn as director of the DNR Environmental Protection Division, charged with protecting Georgia’s air, land and water resources. Dunn, now deputy director of the Office of Planning and Budget, will be joined by new Deputy Director Lauren Curry, Georgia Emergency Management/Homeland Security Agency's chief of staff and former DNR director of public and governmental affairs. UGA geneticist Jill Anderson received a $1.1 million National Science Foundation grant to study how climate change effects plants. Recent deaths include Golden Isles community leader and former Board of Natural Resources member Walter McNeely of Brunswick and Columbus naturalist and businessman Neal Wickham, founder of the Pine Mountain Trail in Harris County. – Fallout is growing locally and globally from a spreading bat disease. – What are puddle parties and who, or what, is fluttering to them. – A 3-foot-plus lake sturgeon highlights restoration in the Coosa River basin. "St. Simons Land Trust buying most of Musgrove Plantation," Florida Times-Union. Also: Coastal Illustrated. "How does an owl fly so silently?" BBC. Also: "Owls pick on wolves to protect young." In a rare glimpse of rare salamanders courting, a female patch-nosed salamander, left, is in a tail-straddle walk with a male, a key step in mating. Photographed by Tim Herman at his Ohio business, Indoor Ecosystems, the behavior had not been seen before with patch-nosed sallies. 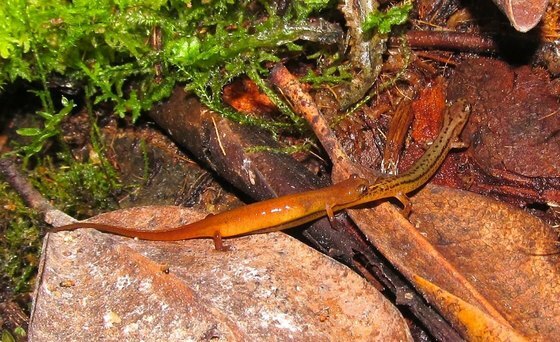 This species, North America’s smallest salamander (adults grow about 2 inches long), was described in 2009 and is known from only two northeast Georgia counties and an adjoining South Carolina county. Herman is hoping for eggs and larvae, which could shed more light on the life of this member of the Plethodontidae family and sole member of the genus Urspelerpes. While working at Toledo Zoo in 2014, Herman documented the first nest of Pigeon Mountain salamanders (“Ohio zoo makes clutch find,” Nov. 25, 2014). Collection from the wild of the patch-nosed salamanders was done via a DNR permit for life-history research.